Note: after a few weeks posting about the Universal Income, here comes the "Universal data accumulator for devices, sensors, programs, humans & more" by Wolfram (best known for Wolfram Alpha computational engine and the former Mathematica libraries, on which most of their other services seem to be built). Funilly, we've picked a very similar name for a very similar data service we've set up for ourselves and our friends last year, during an exhibition at H3K: Datadroppers (! ), with a different set of references in our mind (Drop City? --from which we borrowed the colors-- "Turn on, tune in, drop out"?) Even if our service is logically much more grassroots, less developed but therfore quite light to use as well. We developed this project around data dropping/picking with another architectural project in mind that I'll speak about in the coming days: Public Platform of Future-Past. It was clearly and closely linked. "The Wolfram Data Drop is an open service that makes it easy to accumulate data of any kind, from anywhere—setting it up for immediate computation, visualization, analysis, querying, or other operations." - which looks more oriented towards data analysis than use in third party designs and projects. Note: a book as a follow up of the exhibition for which fabric | ch designed the scenography last May at the Haus der elektronische Künste in Basel (project White Oblique, downloadable pdf on our website). I was implicated in a double way in the exhibition due to the fact that the content of the design research I'm jointly leading with Nicolas Nova for ECAL and HEAD, Inhabiting and Interfacing the Cloud(s), was also exhibited. I have the pleasure to publish a text in the book about the state and objectives of the ongoing research as well. 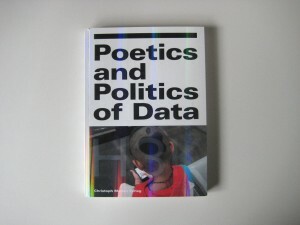 Note: we’re pleased to see that the publication related to the exhibition and symposium Poetics & Politics of Data, curated by Sabine Himmelsbach at the H3K in Basel, has been released later this summer. The publication, with the same title as the exhibition, was first distributed in the context of the conference Data Traces. Big Data in the Context of Culture and Society that also took place at H3K on the 3rd andf 4th of July. The publication serves both as the catalogue of the exhibition and the conference proceedings. Due to its close relation to our subject of research (the book speaks about data, we’re interested in the infrastructure –both physical and digital– that host them), we’re integrating the book to our list of relevant book. The article A short history of Clouds, by Orit Halpern is obviously of direct signifiance to our work. The "communal service" is in fact a statement, the statement becomes the navigation interface. The two main sections of the website are composed by the parts in which you can play with or search for data. We drop off and we pick up is the area where one can see what can be achieved with data. Obviously, it is either possible to declare (drop off) data and tag them, or retrieve them (pick up) - image above -. You can also Search data following different criteria -below-. Usual data will certainly be live feeds from sensors, like the one in the top image (i.e. value: lumen). But you could certainly go for more interesting things, either when you'll create data or when you'll use them. The two images above are about "curiosity" data. They were captured within an exhibition (see below) and are already partially interpreted data (i.e. you can leave a connected button with no explanation in the exhibition space, if people press it, well... they are curious). As another exemple, we also recorded data about "transgression" in the same exhibition: a small digital screen says "don't touch" and blinks in red, while an attached sensor obviously connected to the screen can indeed be touched. Childish transgression and slightly meaningless I must admit... It was just a test. But you could also declare other type of data, any type, while using complementary tools. You could for exemple declare each new image or file within an open cloud service and start cascading things. Or you could start thinking about data as "built" artifacts... like we did in a recent project (see below, Deterritorialized Living) that is delivered in the form of data. Or you could also and of course drop off static data that you would like to store and make accessible for a larger community. Possibilities seems in fact to be quite large. 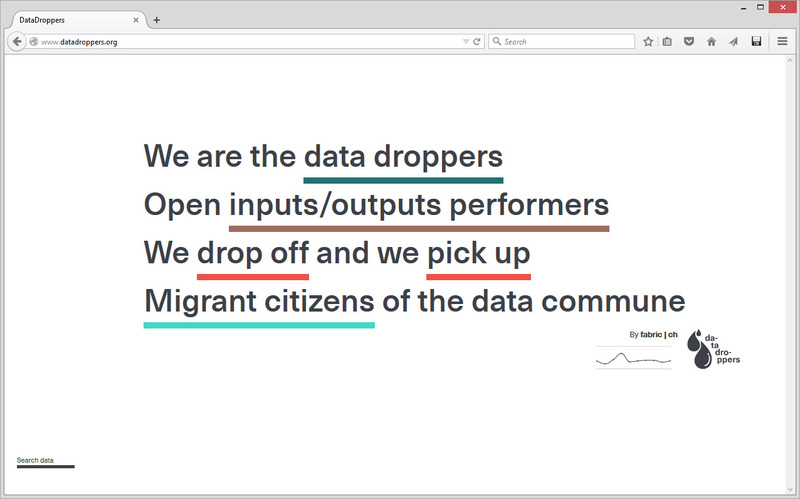 Datadroppers as a commune could even be considered as a micro-society or nation. It comes with a dowloadable "flag", if you desire to manifest your attachment to its philosophy or plant it in your datacenter! Some views of Datadroppers in first use during Poetics and Politics of Data exhibition at the Haus der elektronische Künste in Basel (Switzerland), as part of the scenography designed by fabric | ch. 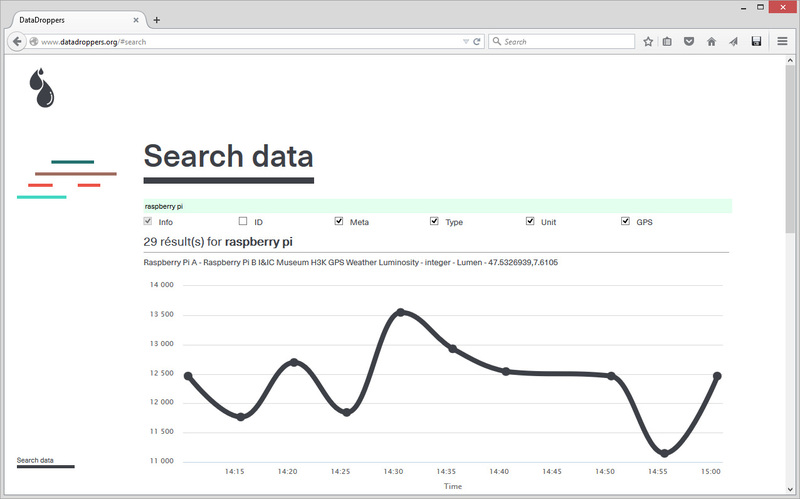 Many Raspberry Pis were installed inside the space that captured exhibition's data and feed the service. They can now be retrieved from http://www.datadroppers.org/index.html#search as the exhibition will end this week-end > search with string "H3K" or "Museum". Deterritorialized Living is an artificial, yet livable troposphere that is delivered in the form of data. Just like if we indeed install atmospheric sensors in a real environment, unless the environment doesn't exist in this case (yet), it is the project. The process is therefore reversed within this almost geo-engineered climate that follows different rules than our earth/cosmos driven everyday atmosphere. We have the open data feed to later set it up. fabric | ch or another designer as the feed is open. We plan to use this feed and materialized it through different installations, like we already started to do. So, for now, this fictive data flow of a designed atmosphere is also delivered as a feed (again: Search data > Deterritorialized), among other ones (some "real", some not), within the webservice offered by Datadroppers .